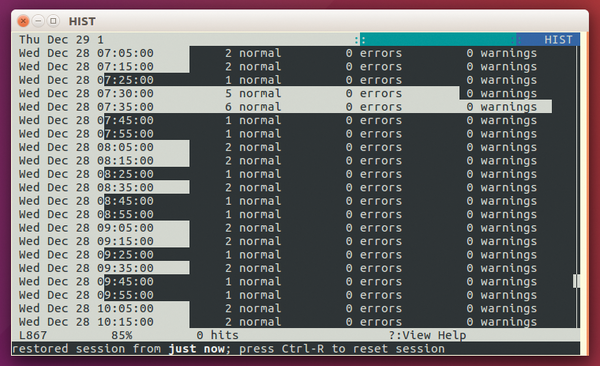 See what's going on in the background of your Linux box by analyzing the logfiles. Broadly speaking, there are two types of software that run on a machine: interactive software that the user launches and controls and background software that runs quietly doing what it needs to do. The interactive software is what you think you're using most often – it's the web browsers and word processors and all the other bits and pieces you launch when you want to do something. However, if you take a look at the processes on your computer (just type ps ax in a terminal window), you'll see that most of the software running isn't anything you launched, but the stuff that runs in the background quietly getting on with what it's doing. For the most part, you don't have to think about this – the software just works, and you get to focus on the interactive software and use the computer in the way you want; however, every once in a while, you have to delve a little deeper and see how this background software is running. When you turn on your computer, the boot system (either the BIOS or EFI) kickstarts a bootloader (e.g., GRUB) that loads the kernel into memory and launches the initialization system. In the past, this init system was a set of shell scripts that launched all the background processes and made sure everything was running as it should. It's the output from this operation that goes into the syslog. 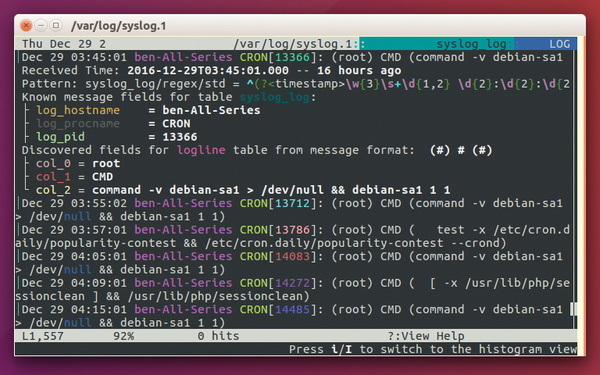 In the past few years, most Linux systems have started using systemd as the init system. One of the biggest complaints about systemd is that it doesn't log to text files, but rather to binary files that are difficult to read. That previous statement isn't completely accurate – in fact it doesn't automatically log to text files, but in most Linux distros that use systemd you'll still find everything that you're used to in /var/log. If you do find yourself using this method of getting data into lnav, you might want to take a look through the journalctl options, because you can select what output to send into lnav. There's far more power here than I have space to cover, but things quickly gets complex, especially if you want to analyze dates or numbers, because that isn't easy to do in Linux text processing (see the "Regular Expressions" box). If you're going to be looking into logfiles, then learning regular expressions (also known as regex) is an absolute must. These can be fiendishly complex, but they don't have to be – learning just a few characters can give you quite a lot of power. Put simply, regexes are strings of text that define a pattern that you want to search for. In the main text, I used the text "cron" to search for those four characters. This is perhaps the most basic usage, as any letter matches itself. The full stop (or period for our readers across the pond) is a wildcard that matches any single character, so cr.n will also match cron, but not croon. The asterisk (*) character is a modifier that matches the preceding character zero or more times. It's most useful when combined with the wildcard so that it'll match any block of text (e.g., cron. 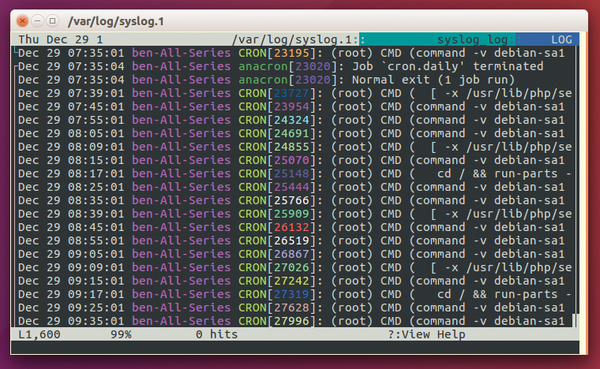 *root will match any line that contains the word "cron" followed by the word "root" regardless of what's between them). These basics will get you quite a long way, but if you want a more detailed understanding of regular expressions, you can read about them on the Linux Voice website . Lnav is a tool that hopes to make it easier to extract useful information from logfiles by making it easy to import them into a SQLite-based data store and then perform advanced queries on them simply and efficiently (for larger setups, see the "Alternative Options" box). You may find the tool in your distro's repositories; otherwise, you can grab a statically linked binary that should run on any Linux system from the lnav website . Unzip this file, and you can run this tool from the command line by navigating to the unzipped directory and entering ./lnav. Lnav is a great option for home computers and small servers. However, if you have a big setup, it can be a struggle because it's not really designed for handling huge amounts of data coming from multiple servers. Logstash is an excellent open source log amalgamator that pulls together logs from many computers and pushes them into an ElasticSearch database that can then be viewed using a visualization front end, such as Kibana or Graphite. In many ways, this is the same approach that lnav takes, just at a high-performance level, and typically it requires a dedicated server just to analyze your other servers' logs. A number of excellent closed-source options, such as Splunk, do a great job of showing what's going on if you're happy using proprietary software in the heart of your server setup. While these are excellent options for large organizations, I'm not aware of any other system that works as well as lnav for small setups. If you're running the statically linked version that you've just downloaded, you'll need to include a path to the executable (e.g., prepend the above command with ./ if you're in the same directory as the file). At first glance, it'll look just like you've opened the text file in a text editor, but unlike a general purpose text application, lnav understands a little about the logfiles, so it can help you find what's happening. For example, press Shift+W to jump back to the previous warning message and Shift+E to jump to the last error message (without the Shift, W and E move forward to the next message, but until you've moved back in the file, there won't be anything forward). If you want to display only lines matching a particular pattern, you can do this with filters. First enter command mode by pressing the colon, and then enter filter-in cron to show only the lines containing the text "cron" (see Figure 1). Similarly, you can use filter-out to show everything except these lines. These filters will be applied to the whole file, so until you cancel them (with Ctrl+R), any other action takes place on the filtered log, not the log as a whole. 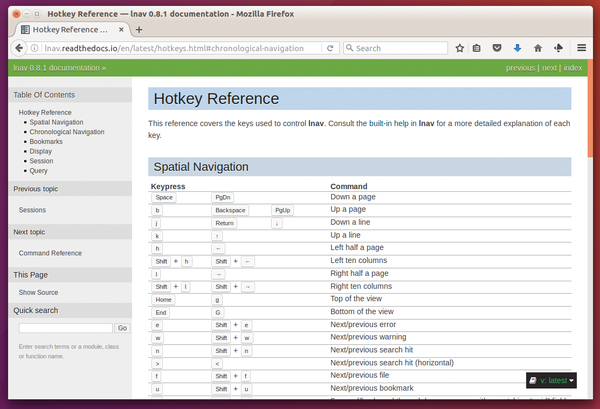 Figure 1: In addition to all the searching options, the colored highlighting in lnav makes logs easier to understand. Perhaps the biggest advantage of lnav over traditional text processing methods for looking through logfiles is that it makes it easy to search by date. You can scroll through by pressing D and Shift+D to move forward and backward by 24 hours (see the "Log Rotation" box if you can't find the day's data you are looking for), whereas pressing the numbers 1 to 6 go to the next nth minute past the hour (with Shift held down, they go to the previous nth minute). Usually, programs continually add new lines to the bottom of logfiles as new issues come up that need reporting. Lnav will automatically add these new lines to your session, so you don't need to worry too much about this. However, it can explain why you might get slightly different results when you run queries at different times. Obviously, if programs keep writing data to logfiles, they would eventually fill up the hard drive, and the computer would fail to start (this happens to most sys admins at least once in their careers). To keep everything logged long enough to be useful, almost all Linux distros rotate the logfiles. The exact process varies a lot between different distros (and is often customized by sys admins on servers), but usually each logfile is moved at the end of the day, and a new logfile is started. A certain number of days worth of logfiles are kept, and old ones are deleted (older logfiles may or may not be compressed to save space). Lnav can read both plain text files and compressed files, so there's no need to decompress older files before running this command. Figure 2: The highlighting in Histogram mode makes it easy to see how much activity has been going on over the log's period. Figure 3: Lnav has a lot of features, but they're well documented  if you are having trouble. If you look carefully, you'll see that this doesn't return all the lines in the table. Since the text lines in a logfile don't all hold the same type of data, lnav can't put them all in the same SQLite table. For example, a cron line might include details of what is run and by which user, while a dhclient line might include details of what IP addresses are assigned to a particular network interface. Lnav gets around this by only matching lines that match the pattern of the currently selected line (i.e., the top line in the terminal window) when you run a command. Press P before entering query mode to see the available columns for this log type (see Figure 4). Figure 4: After pressing P, you can see the details lnav has managed to glean from the current log line. I don't have time to delve fully into SQL here, but many of you will already be familiar with this database language, and SQLite supports all the major features, including aggregation, which can be a really useful tool for building up a high-level overview of what's going on in your logfiles. If you don't know SQL, then you can still find out most useful information using filters and the histogram mode in lnav. The pipe-line-to command works in much the same way, but it only sends the current line, regardless of what is or isn't marked. Once you've found the lines you're looking for, you may well want to extract them for future use. This could be as simple as keeping a copy of them to use in the future, or you might be writing a report about a particular event and need to document what's happened. Whatever the purpose, you can get data out of lnav in a couple of ways. One way is to extract the bookmarked lines to another text file using the append-to <filename> or write-to <filename> commands. Alternatively, you can output the results of an SQL query as either CSV or JSON with write-to-csv <filename> or write-to-json <filename>. This article has been a whirlwind tour of the main features of lnav and should give you a valuable new tool for finding out what's going on deep in the heart of your Linux box. Hopefully you'll find that next time something goes wrong, it should be a little easier to figure out. Programmers and Linux administrators appreciate the benefits of event logs. The Glogg tool is the perfect choice for searching even large logfiles. If your hardware or software goes on strike, or the graphical system or your Internet connection fail, checking the logfiles can often be a big help. In this month’s column, we will look at the command-line tools that can help you scour the depths of these critical files.